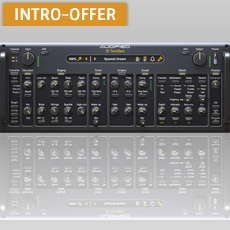 ToneSpot Acoustic Pro - Optimizes the sound of acoustic stringed instruments, now only € 45! After April 26th € 89! You need that outstanding tone you are hearing on your favorite album. So you bought an awesome instrument and a fantastic amp. Maybe you have also bought some beautiful stomp boxes, expensive rack units and phenomenal microphones. You use many hi-end plug-ins. But what? Your dream-tone is not there when recorded and mixed with the rest of the band? You are endlessly tweaking and tweaking your sound, you tried everything. No success. Why? - Acoustic instruments can take a lot of processing even the natural tone is needed. It’s because of the context. Acoustic instruments can fight against busy arrangement with several layers of instruments clashing into each other. Or the recordings are sounding too sterile, thin or harsh. So you need the tone that can cut through. The tone has to be harmonically rich and fat sounding, but it also needs to have a lot of clarity and tightness at the same time. But it’s not all! Even if the instrument is heavily processed, it also has to be very natural sounding at some point so everyone knows what instrument is played. And that's why you need ToneSpot!